The Perfect Organic Garden Pots To Grow Your Saplings & Starters - Start Today! Do you want a greener thumb - a way to increase your changes of planting success? Are you sick and tired of planting and growing your favorite plant saplings with love and care, only to see them wither from the shock when you try to transplant them to your garden? If that's the case, then we have the perfect product for you. These amazing organic peat pots will prove to be exactly what you need! As any agriculturist or gardening enthusiast will tell you, planting saplings and seedlings is a tricky business. They often require to be initially grown into a small peat pot and then transplanted - a process many of them aren't strong enough to survive. These amazing pots are here, however, to provide a simple solution to that millennia-old problem. Just grow your seedlings, and then plant them in your yard or garden without removing them from the pots. No transplant shock, no root circulation, and no withered plants and flowers - it's that simple! The secret to these unique starter pots is that they're made from nothing but spruce fibers and peat moss. This makes them 100% natural, organic, and biodegradable. They are sustainably produced and environmentally friendly, and can be used for aquaponics and hydroponics, as well as for traditional growing methods! Order Your Own Premium Organic 4" Peat Pots Pack By Daniel's Plants Right Away! 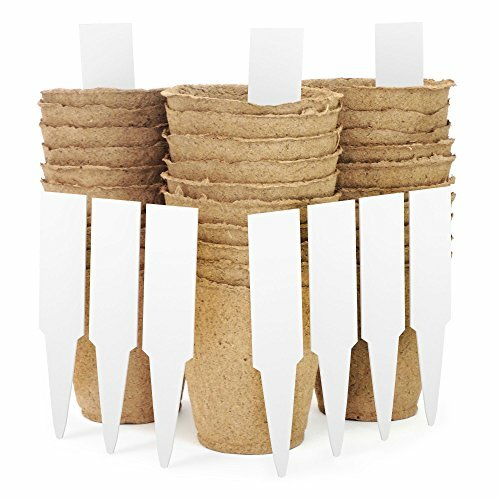 GREAT FOR SAPLINGS & STARTERS: With a 4-inch diameter, these organic peat seedling pots are perfectly sized for starting flowers, herbs, and vegetable saplings like tomatoes and cucumbers. ECO FRIENDLY MATERIALS: When it comes to our starter pots for seedlings, we use nothing but 100% natural and biodegradable pots with organic peat. It literally doesn't get more eco-friendly than that! If you have any questions about this product by Daniel's Plants, contact us by completing and submitting the form below. If you are looking for a specif part number, please include it with your message.